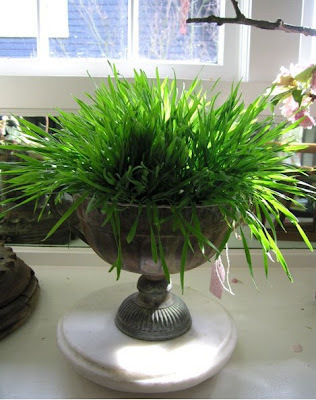 One of my "big ideas", back from when my planning began so long ago, was to cover the place card table with huge pieces of wheatgrass. 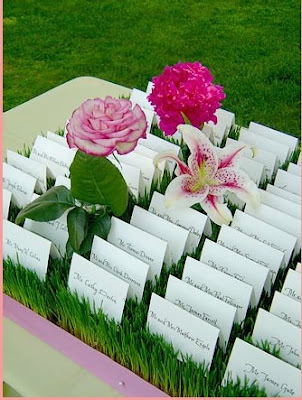 I would use little garden markers as the place cards and ask the florist to create a big, organic and garden looking arrangement to shoot up through the center of the table. This image from Dilly Lily is what got me thinking about wheatgrass. Wouldn't this be even cuter with lots of miniature flowers springing up all over the place? I ended up deciding that wheatgrass didn't complement the look that I was going for as it is a little too whimsical rather than vintage Secret Garden. I still love it and I have been trying to convince others to go for it. This urn arrangement from housemartin would be a wonderful centerpiece to complement those placecards. Why, thank you! That was kind of my problem too... just not the right green. Hey, this is for the girl jammy that commented above me. We are doing wheatgrass centerpieces, even though our colors are pink and yellow, I couldn't resist how cool they are. Anyway, we are adding some flowers into the flower pots that will hold the wheatgrass with some water pics. They are those plastic vase-like things that you get when you buy just one rose. This way the flowers won't die and they will stand up straighter. I hope this helps. I really like this idea.. but does anyone know a cost effective way to do this for placecards when you need large patches? the wheatgrass kits seem pricey. maybe regular grass? Thanks! Wow! It's special idea. We can put some ochid flowers. Gorgeous!! I really think it's an awesome idea to try out the wheatgrass in that sort of urn. I'll give it a try if you don't mind. Well this is great to me wheatgrass says good health and happiness. I think it would be great for a wedding as a symbol of life.